"These use only 1/2 cup butter." Preheat oven to 375 degrees F ( 190 degrees C). Sift together in a large bowl flour, baking soda and salt. To this add sugars, egg, vanilla extract and butter. Beat until smooth and well blended. Stir in nuts and chocolate chips. Drop by teaspoonfuls 2 inches apart on ungreased cookie sheet. Bake for 10-12 minutes or until golden colored. Cool on wire rack. This recipe was a waste of ingredients because once we mixed the dry ingredients and put the wet into that the mixture didn't turn out! Really good! Yum! I creamed the butter with the sugars, then added moist ingredients and then mixed in the flour mix. Cooked for 10 min - they came out just right. If you want a perfect chewy cookie recipe that is fast to make then try this one! I just used crisco in place of the butter and they were wonderful! Great recipe! 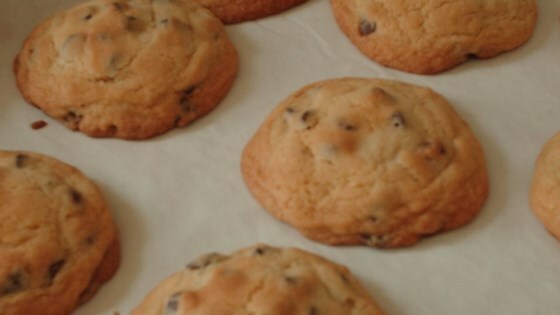 Very yummy, simple, chocolate chip! I didn't have any nuts but they still turned out great!